Most people think of promotional products as marketing tools for businesses to hand out at trade shows or to use as giveaways to customers. But it should also be known that the same products that help to brand businesses can also serve non-profit organizations in a similar fashion. For non-profits, customized apparel and products can be multi-tasking wonders, especially at fundraising events. When your organisation hosts an event, your staff can be outfitted in customised t-shirts, polo shirts or hats. Non-profit employees work hard and appreciate the gift of customised apparel that reinforces their passion for the cause. In addition, customised shirts and hats display professionalism while still being fashionable and comfortable. Your staff members will also continue to wear these items on their off time, spreading word of your cause and branding your organisation. Custom clothing is also a great gift for volunteers. It shows your appreciation for their efforts and is a great way for them to proudly display their support of your mission. With so many clothing options to choose from, you can tailor the items to suit the specific needs of you volunteers. Fixing a structure outside in the cold? Provide them with windbreakers or plush hoodies. Spending the afternoon landscaping in an underserved community? Hand over some water bottles or visors for sun protection. Other useful items at events are tote bags, lanyards and rain gear all bearing the organisation’s logo. These thoughtful gifts will not go unnoticed and will increase recognition of your work with every use. Get started on your new line of customised clothing and promotional products for your organisation today with the experts at EmbroidMe. With a network of stores nation-wide, there is a store near you. 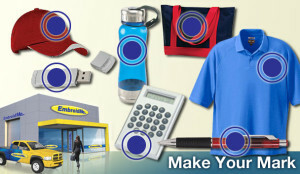 Find the best embroidered clothing, promotional items and personalised gifts for any occasion. EmbroidMe prides itself on expert craftsmanship and top-notch customer service. Find your perfect gift today. What is Digital Garment Printing? Why its ideal for Custom Tees! Why custom tees have become so popular – The Decorated Apparel Industry was taken by storm in late 2004 when some of the first commercial based direct-to-garment printers were released. Before you can truly understand why DTG digital garment printing has become so popular, you will need to understand some background history. For years, if you wanted to print a couple of cotton shirts, or custom tees you would use either digital transfer paper or try to screen print the order. Both of these decorating methods have their positives, but they also come with negatives. Digital transfers for clothing and custom tees allow you to create as little as a one-off custom tees or shirt via a standard desktop inkjet or laser printer. The cost to make a single transfer for clothing and custom tees can range from $5 to $10 depending on the cost of the commercial printer, quantity and what ink and paper is used by the printer. However, the transfer paper is covered with a polymer (AKA adhesive) that glues the ink to the top of the clothing and custom tees. The polymer typically will leave a hand where it is applied and can discolor the shirt or create a window around your graphic. New transfer papers have been released that either minimize the window or uses a 2-step process to eliminate the window completely. Screen printing has traditionally been the decorating method of choice for most of the apparel that you see in retail stores. With screen printing, ink is only dropped down on garment where the design is, thus eliminating the undesirable window that can occur with some digital transfer paper. However, a graphic must be separated (the process that breaks the down graphic into the different colors needed to print it), a screen must be burned for each color and it requires a screen printing press to be setup. This can become a very time consuming and expensive process when you only need a few custom tees. Commonly referred to as a short run, which can be as low as 1 custom tee to as many as 48 custom tees depending on the size of the shop, the cost per a screen printed shirt could easily be more than what your customer is willing to pay for. With the changes in fashion leaning more toward short-run, limited edition personalized garments and custom tees, the need for a high quality solution grew. Of course, apparel decorators are never satisfied with the concept that things are never going to get any better. Manufacturers and distributors continued to push the boundaries by finding cheaper and faster ways to screen print or to creating better inkjet transfers papers with less hand or feel to them. But the introduction of DTG digital garment printing allowed us to take the positive aspects of both inkjet transfers and screen printing in a solution that could be done in a compact space. The concept of DTG digital garment printing for custom tees is basically using a digital printer to lay down a textile water-based ink that has chemical binders that allow the ink to remain on the garment without a polymer being applied to the top of the shirt like a transfer. 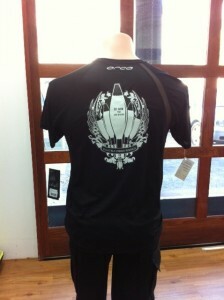 The ink is then cured to the custom tees using either a heat press or a textile conveyor dryer. On average, an apparel decorator can take the artwork from a customer, put it on to a garment and get paid by the customer in less than 10 minutes. With some modification to the artwork, the decorator can personalize the next garment with a name, number(s) or different colors and produce another custom garment in minutes. That is the beauty of DTG digital garment printing – short run, personalized garments in the matter of minutes. Which type of method should you use for imprinted apparel? When looking at garment decoration printing options, many times the decision comes down to a choice between four main options—each with its own strengths and weaknesses. For printing directly onto the garment your choices are direct to garment digital printing (DTG) and traditional screen-printing. The other methods would be sublimation or thermal transfers. As stated above, each of these processes has its own pros and cons. You should make your decision based on the factors that are most important to your business application. Thermal transfer printing for custom tees involves the smallest initial investment, you simply need a conventional inkjet or color laser printer with the proper transfer paper and a heat press and you are ready to go. The most common complaints about thermal transfers are cost per print, inconsistent wash results, peeling and/or cracking of the transfer, outline of transfer paper visible on the custom-tees and unnatural feel of the custom-tees where the transfer was placed (heavy hand). The issue of the outline of the transfer paper can be addressed by trimming the transfer prior to pressing, which can greatly add to the production time. The typical inkjet printer using off the shelf inks and moderately priced transfer paper will print a letter sized transfer (8½” x 11″) for about $1.50 – $2.00. The process is simple to learn and friendly to most cotton and cotton blend custom tees but, it is also a process that any consumer can reproduce at home with their own desktop printer and a “t-shirt printing kit” for custom-tees from their local office supply store making it somewhat difficult to sell. As inkjet and laser printer inks are translucent, thermal transfer printing is a white or light garment decoration option only. Sublimation transfers differ from thermal transfers in that they are a dye that actually transfers from the carrier paper to the garment. When heated, sublimation pigments pass from a solid state to a gas state (never becoming liquid) and imbed themselves in the fibers of the garment. Sublimation produces a print that has virtually no feel (little or no hand) on the garment. 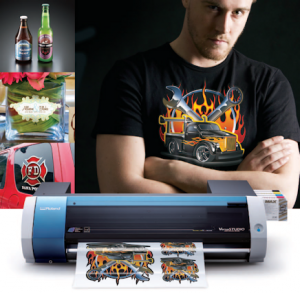 Sublimation is more expensive to get into than thermal transfer printing, as you need a dedicated inkjet or color laser printer as well as specialty sublimation inks and a heat press. A full set of sublimation inks can run into the $400+ range for the typical inkjet printer toners for color lasers are sometimes $500-600. Unlike thermal transfers, screen-printing and direct to garment printing sublimation needs a synthetic substrate to effectively transfer to simply put it is not cotton friendly. Sublimation is definitely the process of choice for decorating non-textiles such as mugs, plates, brass and aluminum. 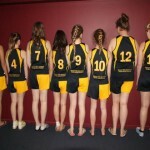 Certain manufacturers now make sublimation ready garments that are cotton with polyester “front”. These shirts do address the issue of needing a polyester shirt (most people don’t like the feel of a 100% poly shirt against their skin) but it comes at a price. A traditional 6-ounce white cotton t-shirt costs a little more than $1 while a similar sublimation ready shirt will cost from $5.50 – $7.00 just for the blank. Add to the cost of the garment another $1.00 – $2.00 for the transfer (8 1/2″ x 11″) and a single sublimation t-shirt can cost as much as $9.00 to produce.